Pen and ink drawing on tracing paper of the second panel from the top on the west face of the east pillar of the North gate of the stupa of Sanchi, by Frederick Charles Maisey. Inscribed:' Sanchi Series. Plate VIII' and 'Pl. VII fig.1'. 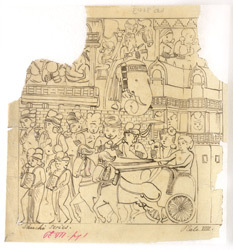 The carved panel reproduced in this drawing depicts a royal procession in which Ajatashatru visits Buddha. The great Stupa of Sanchi is the finest example of monumental architecture of the Shunga era. It consists of a large hemispherical dome which was built over an already existing stupa ascribed to the 3rd century BC from the time of the Buddhist emperor Ashoka Maurya (reigned circa 269-232 BC). The stupa was later enlarged around the1st century BC under the Shungas and four elaborately carved gateways were added at the cardinal points. The North Gateway consists of two square posts crowned with a group of four elephants and two 'shalabhanjika', females figures grasping the branch of a tree. These support a triple architrave with scrolled ends. The gateway is completely covered of sculptures depicting various episodes of the life of Buddha Sakhyamuni from the Vessantara Jataka and the Chhaddanta Jataka and other scenes such as the Miracle at Sravasti, the Buddha's departure from the palace, and the temptation of Mara.